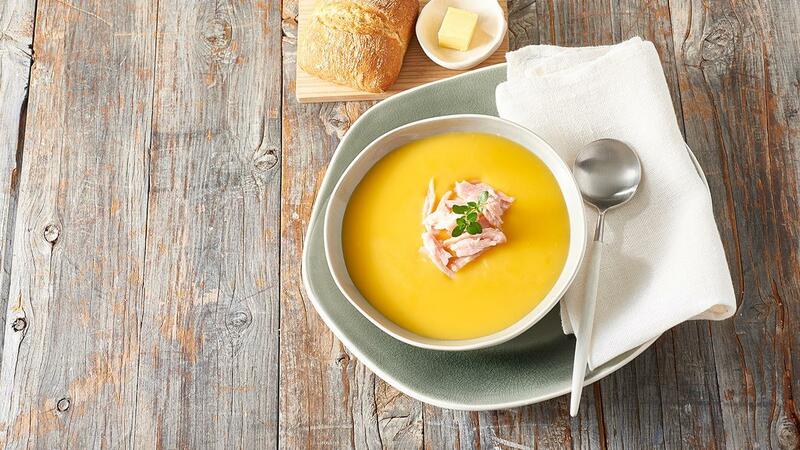 The addition of caramelised roasted garlic and smoky ham will really boost flavour and complement the creamy golden pumpkin in this soup recipe. Simmer water and CONTINENTAL Professional Gluten Free Cream of Pumpkin Soup Mix in a large saucepan for 5 minutes, stirring continuously. Slice garlic bulb in half, combine with pumpkin and drizzle with a little oil and bake for 20 minutes at 160 degree Celsius. Allow the garlic to cool slightly then squeeze the flesh from the skins and add to pan, along with the pumpkin and ham. Cook for a further 10 minutes, then blend and stir through cream just before serving. Serve soup garnished with basil. Bulk out with carrot or any starchy vegetables such as sweet potato, parsnips or potatoes.